In case you were worried that I am running out of fabric . . .
No need to worry! 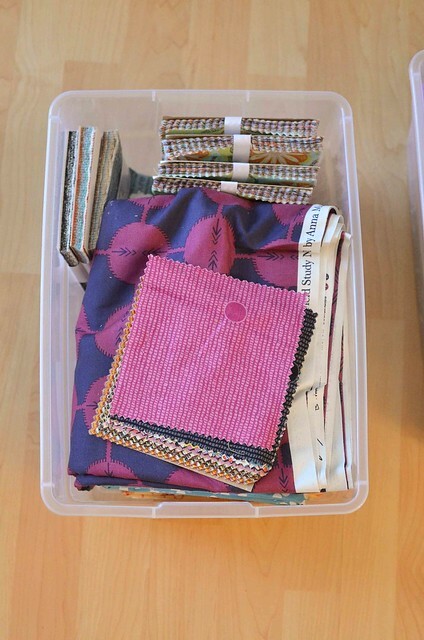 I was heavily inspired by Adrianne's post (plus the linkup at Sarah Quilts) about her stash this past week and decided that it was time to organize my own. Needless to say, my husband has been walking around with a scowl since I started this process. I keep telling him that surely some people have more fabric than I do, but I don't think that's making him feel better. I have WAY more than I thought. When I started sewing a few years ago I stashed my fabric in the back of my closet. When I ran out of room there, I started to put it a dresser that my husband bought for my sewing supplies. And when that filled up I started filling random baskets and covering flat surfaces around my house. Clearly I have a problem. I decided that I needed to organize my stash into a centralized location so I went and bought seven 27L plastic containers from Target. Surely that would be enough. I have my pinks and reds. The oranges, yellows, and greens. The rainbow-y, blacks, greys, and browns. These are neutral solids and some collections: Out to Sea, Far Far Away II, Nordika, Sherbet Pips, Melody Miller typewriters, Simply Color Ombre, Briar Rose, Lucky Penny, and some AMH. Clearly I really like Florence. Also the low volume prints. I also have some collections here: AMH Voile, Glimma, solids, Happy go Lucky, and some more Lucky Penny prints. Several quilt backings and some charm packs. And stuff for the Lotta Jansdotter quilt that I am supposed to be making for my bed but that I haven't worked on for at least 6 months. And no, that's not all. Clearly the 7 big bins (plus 3 smaller bins) were not enough. All of my larger-than-a-half yard prints are still stacked up in my closet. Clearly a destash is in order, but I'm not quite sure how to do it. Have you had any luck destashing fabric? Would anyone be interested in a giveaway involving a box of random prints? That seems like it would be easier than destashing individual prints and I would be happy to donate them to a new quilter if someone is interested. Linking up with Sarah Quilts. I'm sure a lot of people would be interested in a giveaway of random prints. It would be nice to see it go to a new quilter, as you say, or someone with a small stash who could really benefit from it. That lets me out -- I have a ridiculous amount of fabric, both bought and inherited! I'm in the same boat with husband and fabric but new fabric is always welcome! I have been amazed at how organized everyone's stashes look. There isn't really any rhyme or reason for how I organize mine. Instead of de-stashing, I always just buy more containers. My stash is the opposite of yours. Mines fits in a couple of baskets under my sewing table. Thank you so much for linking up! Your stash is beaauuutiful! I love each and every choice. I see tons of familiar prints from my stash and from my wish list! I love the way it is organized- by color but then you felt free to break the color rule to keep certain things together. Very nice. And um, did you see my stash? It could definitely use some of your de-stash love! I even accept scraps. :) I saw Julie at 627 is encouraging a Sunday Giveaway linkup. A giveaway is fun, but you could probably destash in an etsy shop pretty easily. Maybe set up the listings as groups of fabrics? Love your stash! And im so jealous of your Florence/low vol bin. You can send any destash or giveaway my way. I'd just list on etsy for bundles of similar colors or like collections/designers and then advertise on the blog you'll probably be able to rid of pretty easily. Thanks for sharing! I've put myself on a fabric buying ban until I use up some of my stash. I'm cutting up my smaller stuff for bow tie blocks right now. Those solids are gorgeous, well all of your boxes are! I think it's time for a fabric-buying moratorium! 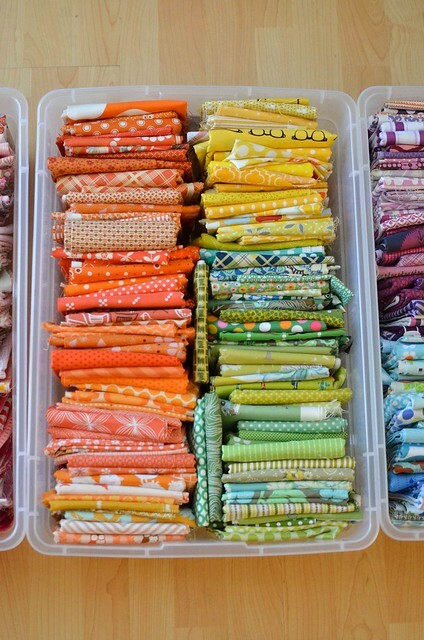 You have so many pretty fabrics--I bet you have some amazing projects lined up to use them, right? 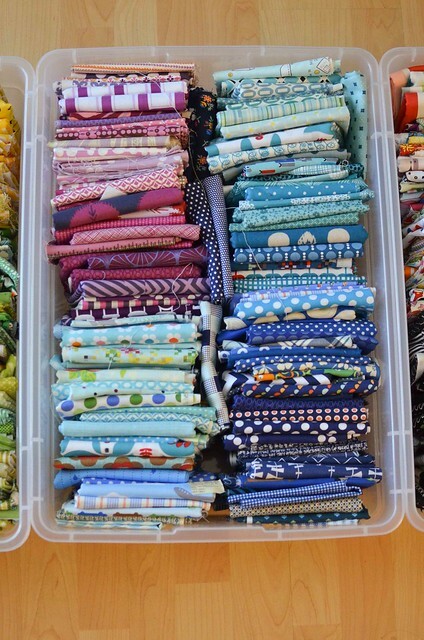 As a new quilter, it's always super inspiring to see other people's stashes. If you decide to do a giveaway, I'd love to enter! 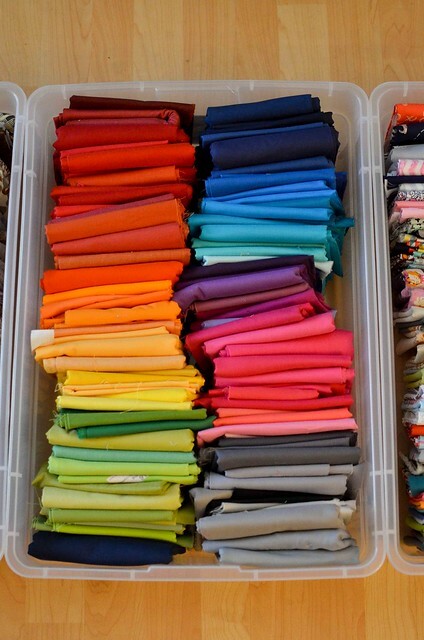 wow, that's a lot of gorgeous, amazingly organized fabric. You go girl!!! A giveaway or a destash of random bundles would be fun. I think it is always good to have something a bit different than what you would choose. I would die for your stash... Oh I just started about a year ago and I struggle with what to buy. I would so be interested in a giveaway, destash or gift, be more than happy to pay postage or whatever. A grab bag??? lisamcgriff (at) hotmail (dot) com Please let me know. You are so organized! And your photos are beautiful. And, yes, I would enter that giveaway. Oh wow Erica - you have a wonderful stash! Since you have already seen my stash you know I'm not in need of any more fabric but I definitely think you could have a successful de-stash sale through Esty or Ebay. It would be a bit of effort but probably worthwhile. Also I don't know if you are a member of a guild but at my guild we had a sale day and I managed to get rid of must of my unwanted fabric for quite decent prices. 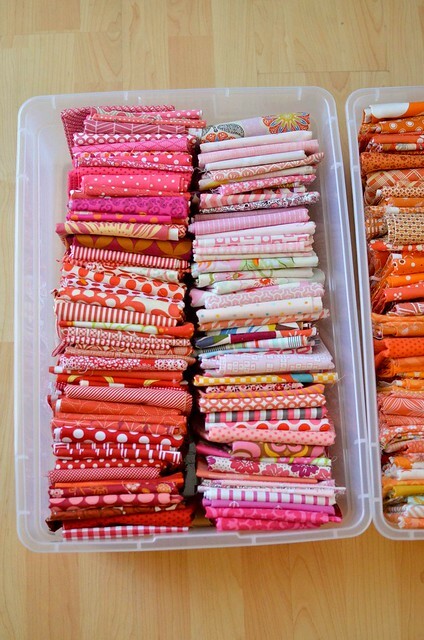 Oh my gosh Erica, this post made me feel so much better about my stash size haha. Next time my hubs complains I can say with documented photographic proof that there are worse off husbands than him ;) thanks so sharing! So many beautiful fabrics! You forgot to post the blue/purple box picture :) super jealous of your lovely stash! If you are doing a giveaway you should see check out 627 hand works as she is organizing Sunday Fun day giveaways. I am guilty. I have too much! Don't know if I'd have the courage to show it! Tell your husband that I definitely have more fabric than you! I have put myself on a fabric buying ban until I have used some of my stash. It has been so tempting to buy more, but I've been having a great time sewing from my stash. 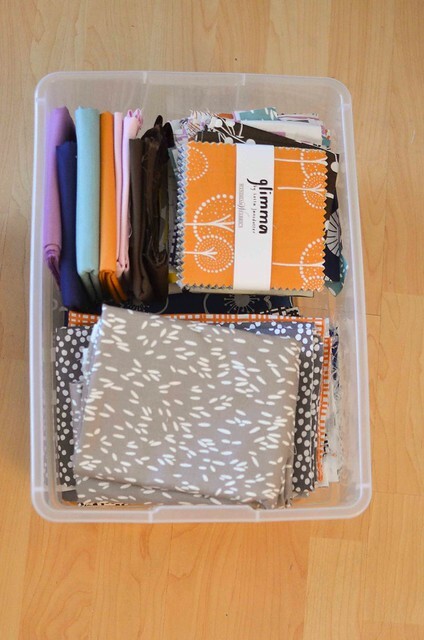 Your fabric bins look lovely! Wowzers!! I'm not one to stash fabric so most of what I have on hand is leftovers from other projects. I have a few pre-cuts that I've bought for no reason and still have, but other than that, scraps and leftovers! Oh my I love your stash :^) I have so much fabric, I'm starting to think it's moved beyond ridiculous into sinful. I *do* make quilts from the stash and from the scraps. But I find it nearly impossible to resist a beautiful new fabric. 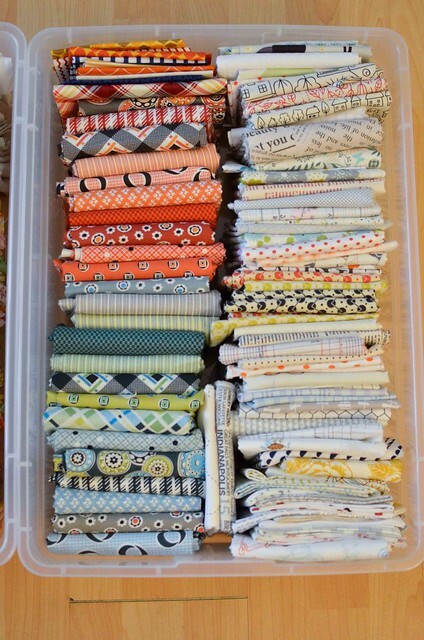 Such a gorgeous stash and I'm pleased to say that I can show your pics to my husband to show that I really don't have that much ;) Maybe cut a strip off each of the FQs and make a Scrappy Trip quilt as a memory of what you have and then give some strips away to spread the love a bit?! Bet you've been inspired with lots of new ideas digging through that lot?! 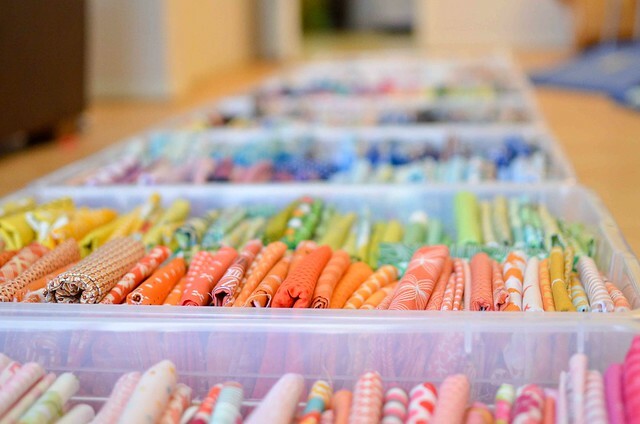 Lucy at Charm About You is having a Destashing link up in September, might work out for some of your fuglier fabrics! You have about 300% more than me, but clear tubs for the win! Wow that looks awesome. Do you think you could stop by my house and do that to my stash?!?! I need to do that with my stuff. Great inspiration! So much yummy fabric! What I always wonder when I get peeks at people's stashes is just how long it takes to build up a stash like that. It must make getting started on new projects heavenly to just be able to pull from so many gorgeous fabrics you already love. Giveaway? Did someone say giveaway? 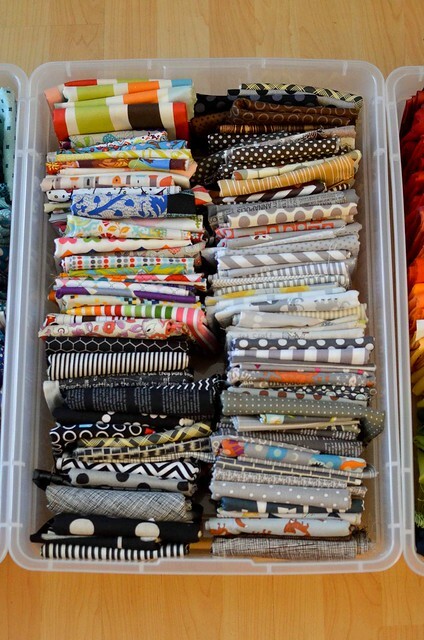 Your stash is really lovely - so many fabulous fabrics. Great job on collecting. I just finished wiping the drool off of my face after seeing all your delicious fabrics!! I have such a small stash compared to yours. 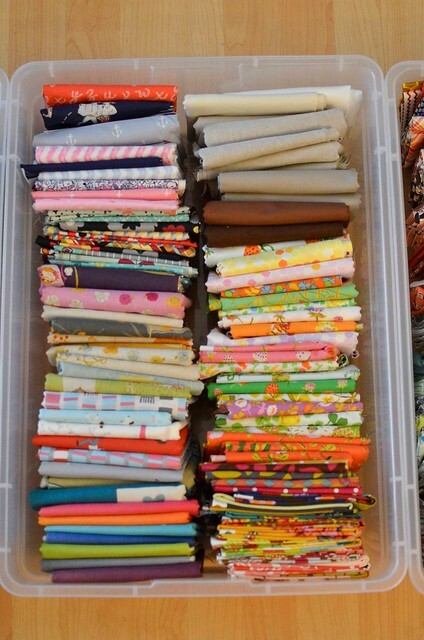 I am tossed on sorting fabric, do I leave pre-cut fatquarter bundles together or do I sort them all out by color? Mine is also stored in totes right now and it is hard to be very creative when you can't see what you have. But, I am working on a nice big hutch to store it in with a view of all. I so hope that you do a giveaway of stash. I would love to win some stash from you. I am a new quilter and just starting to gather a stash. Thank you for wanting to share. I think you would do a giveaway or let us take some of that stash off your hands. Give us a decent price and I bet it would go fast. What a lovely stash! I'm a new quilter and would love to enter a giveaway if you decide to have one. I fell hard for the scrappy hexagon quilts I keep seeing everywhere, so I'm always looking for scraps to add to mine. I teach sewing to kids with autism. We could always use the extra fabric. We made w quilt for auction this past school year. You have a very impressive stash. 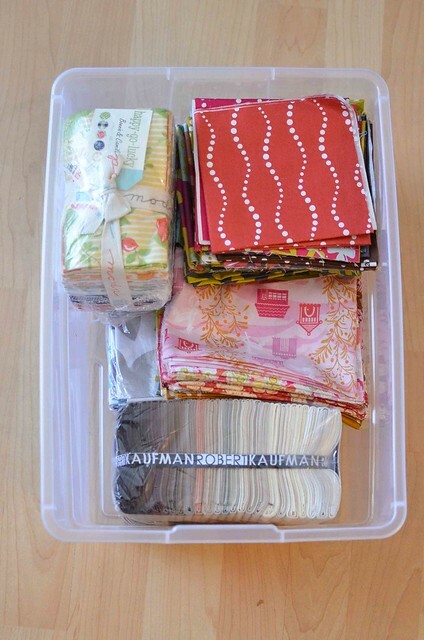 I'm a new quilter a d have been asking everyone the best way to build up a good stash! Any tips?! Yes, to the giveaway! Charm About You is hosting a Fugly party next week for exactly this sort of thing - I've been through my stash this weekend to see where my gaps are, I am rather envious of your stash, it's certainly something to aspire to for a newbie quilter.